What is Your "RPG Rule Zero?" My Rule Zero is "You must have faith in the DM to run a fair and fun game and to interpret the rules of said game to ensure fairness and fun." This rule tends to not sit well with rules heavy games, but as I tend to avoid most rules heavy games, that isn't much of an issue. 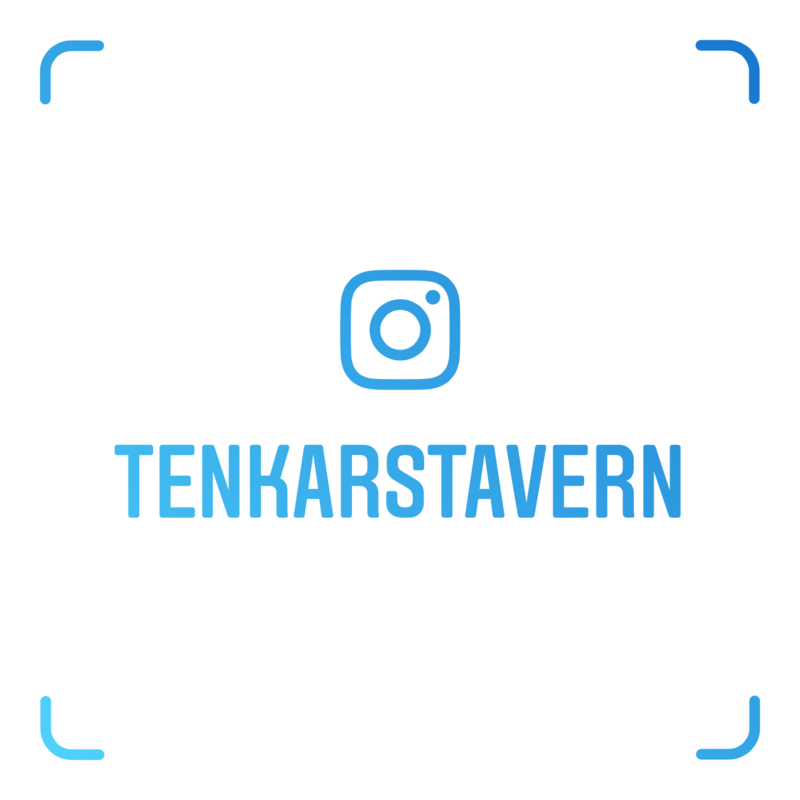 The first episode of the Tenkar & The Badger Podcast records on Monday evening (and should go live on Friday for the masses) - a mere two days from now. +Matt Finch will be the guest for the first episode. 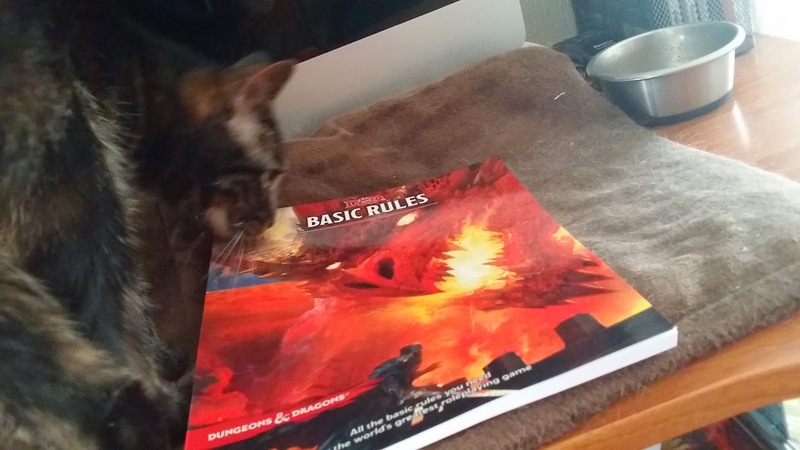 My POD Copy of D&D 5e Basic has Arrived! Someone uploaded the D&D 5e Basic Rules to Lulu last week. They were only up for a day or so, but I snagged a copy while they were there. 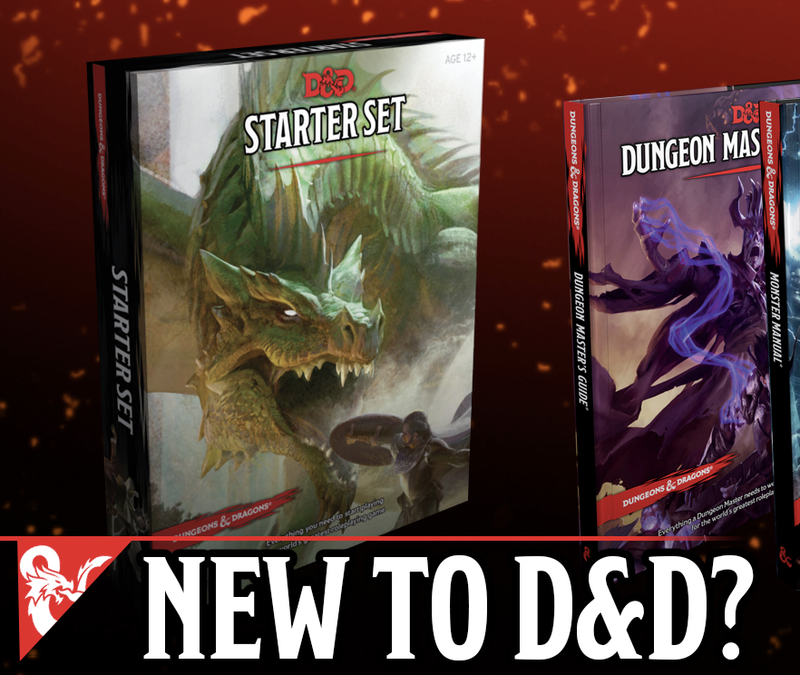 All I can say is this: WotC should seriously consider putting up an at cost POD option for the D&D Basic Rules at the DnDClassics storefront. This is a much more table friendly version than the PDF. House Rules - Do You Do Them and Why? Recently I was asked if I had my house rules for S&W in one place, and the answer I wanted to give was "Yes. In my head." It's not that I don't have them written down - most if not all of them have been posted and discussed here at The Tavern - I just don't have them all in a single post, let alone a downloadable document. Maybe with next week's mostly staycation I'll have a chance to rectify that. 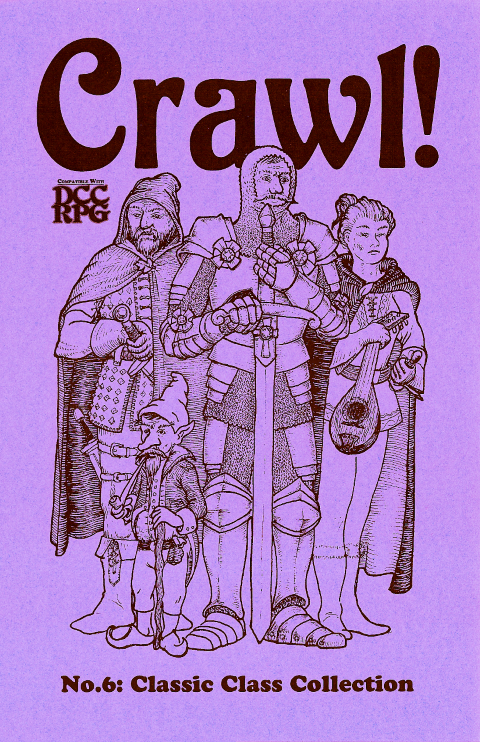 The thing is, with me, I find it damn near impossible to run any game, especially an OSR game, as written. With nearly 35 years in the hobby, I have my own ideas of what works best. These days, with all of the OSR games available (many for free) making a mongrelization of the various rule sets is much like picking from the classic Chinese Restaurant menu - 1 from column a, 1 from column b, etc. 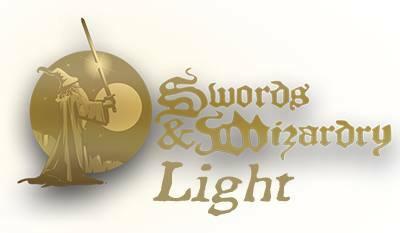 Swords & Wizardry Complete is my baseline, but my games step far away from that baseline in actual play. Do you use house rules in your campaigns? Just a few minor ones or a crapton of large ones? Maybe something inbetween. Do you RAW (run as written) and if so, why? If you house rule, why? What can I tell you about +Lloyd Metcalf ? Well, he was the main artist doing work on Whisper & Venom (a NTRPG Three Castles Award Finalist and ENnie Award Finalist for 2014). I actually own one of his original pieces of work. I truly do like his art. I have no idea about his adventure writing, but I'm willing to make a bet (with my own money) that Lloyd writes a decent adventure. I guess I'll find out with his RPG Mini Mods. $24 for print copies of all three mini mods, $32 if you want a set of three 5"x7" prints of the covers. Can you guess what level I'll be ponying up for? Let's face it, not every GM has time to sit down and prepare adventures on short notice every time the players decide to pop in for some RPG fun. A Mini Mod quest is simply a side quest in short format, designed to serve many purposes. A Mini Mod can be a quick one-off adventure or a side quest in a longer campaign. You can use a Mini Mod to unobtrusively make sure that players come across objects or tavern-rumors with connections to larger story lines. You can also use one to enrich the campaign setting in a longer story arc. 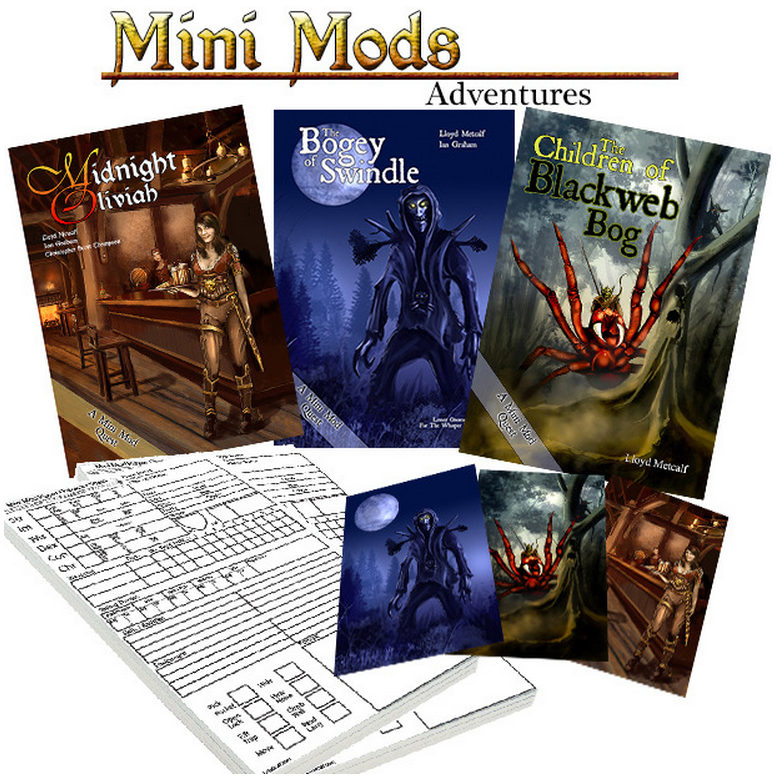 Mini Mods will keep your players entertained and give them things to do while other events are cooking. You can use them as a springboard to further adventures or just to add depth to your world, and all with minimal pre-planning time. This Kickstarter will raise the funds necessary to produce 3 complete Mini mods in their entirety. The Bogey has previously been done, but will receive a re-write and some added details from our newly added writer Christopher Scott Thompson along with Ian Graham and myself (Lloyd Metcalf). Christopher is already hard at work fixing up The Bogey of Swindle and ironing out the bugs in "The Children of Blackweb Bog". Two great mini mods to get the ball rolling. We will pay our professional writer to help us along in creating "Midnight Oliviah" with successful funding. A mini mod inspired by a lady known to a number of Texans, but loaded with character ready for any world. I was thinking about one shots / convention play, and how it plays out differently than campaign play. But then I thought a bit about campaign play, and even with campaign play there are different methods. Episodic play is much like the average TV series - each episode is self contained and has little direct effect on the following episode (there are obvious exceptions like Game of Thrones and The Walking Dead and such). 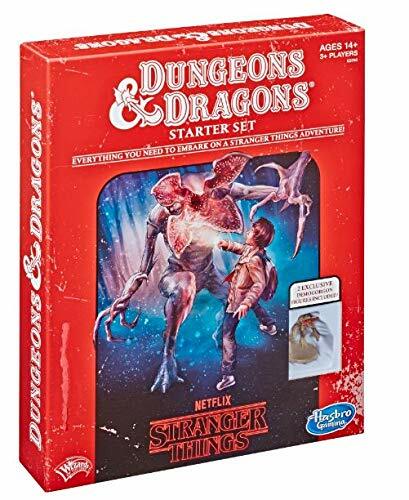 I see the DCC RPG as written defaulting to episodic play. Start each session (or story arc - which is a whole 'nother post) with the party ready to jump in and go. Wrap up at the end of the episode, hand have weeks or months in between and then move on to the next piece. The nice thing about episodic play is that the DM can handwave lots of the time sinks in between sessions (travel especially). I've heard only good things about the One-Roll Engine, especially Wild Talents, on the Happy Jacks Podcast. I also received Godlike in some bundle or other, and I really like the setting (although to be honest, I didn't look at the rules themselves, as supers is generally not a genre that I readily embrace). This is a very tempting bundle, as I suspect if I did play a supers game, it would probably use the rules / setting of Godlike. I like inspirational tools when I'm brainstorming some adventure creation. It's why blogs like The Dungeon Dozen and resources like the D30 Sandbox Companion are so popular. They don't give you a finished product - but they give you inspiration for use in limitless adventures. Non-Player Cards: An Artful & Inspirational Generation Tool is something similar, but it's for use in generating memorable NPCs (although I expect players could use it to add depth to their PCs) and includes something that most other products of the sort don't really stress - inspirational art. That is the whole point to putting this on cards, it is not? In many cases, NPCs are one of the trickiest aspects of GMing. Questions about: What should I name him/her? What should their role be? Their occupation? How will they act differently from the last 50 NPCs I've already used for my players? All surface as a GM. Non-Player Cards is a deck of 300 cards that can be used with any tabletop setting, allowing you to create and build NPCs and characters for any game you choose to play. Is there a book with the same information? Yes! In addition to the Deck, we are packing all of those cards into the Reference Booklet! Every backer who receives a PDF reward will also receive the PDF of the Reference Booklet. 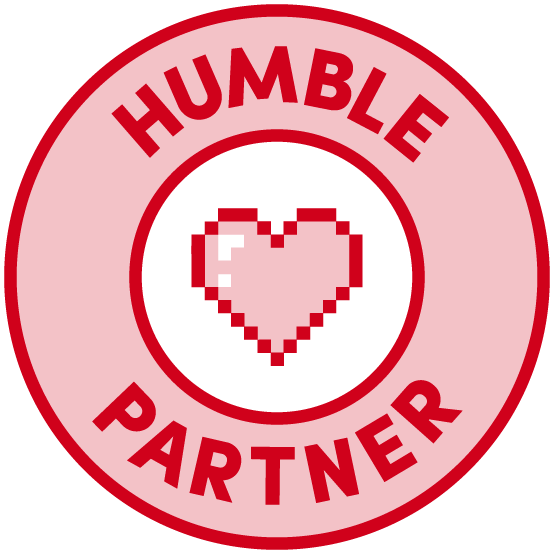 If you want the Booklet in print, there’s a backer level for the PDFs and Print Booklet! OR if you want the Deck and the Booklet, it’s just a $10 add-on ($12 international). The book will be ~50 pages, 6x9, in full-color and printed through DriveThruRPG's (DTRPG) Premium Print format. So, book, cards or both, there is a method that should work for you. Me? Personally, I love using cards for this stuff instead of dice, as the art itself can inspire. Which reminds me, I need to review Creature Decks: 0e/1e RPG Creature & Encounter Decks. Yep, I'm finding the use of cards / art for inspiration to be invaluable. Do you feel more comfortable as a GM, a player or can you easily embrace both roles? I see myself primarily as a DM / GM, but I've been having a blast when the opportunity to play as a player comes my way. There was a time where I had difficulty feeling comfortable as a player, but I find these days I can embrace it and enjoy. Between the past weekend's stress, the current multitasking at work, puppy prep and safety check for the weekend pick up and getting some prep in for the recording of episodes 1 and 2 of the podcast early next week (yeah, it kinda just worked out like that) among other projects I need to work on, all of which means that the 2 to 4 posts a day are probably going to slow down to 1 to 2. No, I haven't had a chance to check the OSR Superstar final entries yet and get them moving on to the judges - hoping for tomorrow, but in truth it may not happen until Thursday. 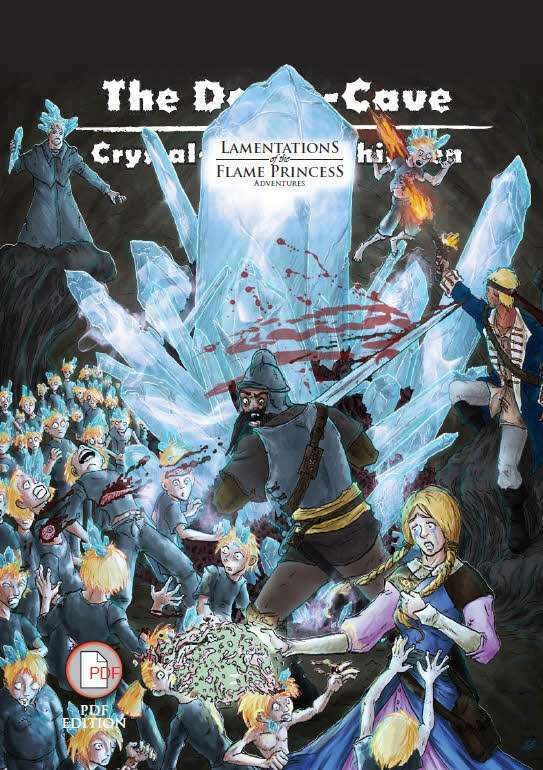 +James Raggi has released the LotFP 2104 Free RPG Day adventure, The Doom-Cave of the Crystal-Headed Children, in PDF as PWYW. So, if you missed it in print, you can now grab it in PDF. If in doubt, grab it now and toss James a few silvers later if you like it. See that banner above? Yep, look up. That one. RPGNow / OneBookShelf is running a Christmas in July Sale with a crapton of PDFs (and possibly Print on Demand - I need to look closer) on sale for a limited time. How much is a crapton? A lot. I'l try and highlight some OSR choices over the next few days - assuming I survive the next two at work. Covering my unit, another unit and assigned to two days of training - I really need some clones. Oh, and for those wondering - Urgent Care cut the ring off my wife's swollen finger earlier this evening and put her on 10 days of antibiotics. I think we're clear for now. Mt DCC game ended shortly after 2 am last night. After some chips and a beer I was ready for bed. Shortly after 3 am, my cell phone rang. Long story short, possible concussion from the fall, but no stroke (as was feared) and all other test s came back normal. She does have high blood pressure, but never knew as she is one of those stubborn folk that avoids docs like the plague. She was released shortly before 10 AM after the tests came back negative. Can you guess I had very little sleep last night? It's been a rough year from October of last year right through... well, now. Thankfully, the man upstairs kept this one with an overall positive - now mom knows she has high blood pressure and will need to see a doc regularly to take care of it. We wrapped up +Craig Brasco 's DCC RPG funnel last night, and the whole experience was a blast. I fully expected Graygor not to survive (total adds + 7 and 7HP) but survive he did - barely. He did have to cast his one shot use of Spider Climb. In the end, for 3 players and 12 initial 0-level PCs we had 4 survivors - 3 were mine. That was literally, pure luck. +Keith J Davies , who lost his last PC in the final encounter, inherited the Cooper.